Head to tail is about 6.5-9 inches and the tail is 3.5-6 inches. Fur color is highly variable ranging from brownish to olive-red in color. During the summer, a black stripe can be seen on the side. The belly is white or cream color demarcated by dark lateral lines more visible in summer. The tail may be edged with white. There is a white band encircling the large, black eye. They occupy coniferous, deciduous and mixed forests eating seeds, fruit, nuts, bark, buds, shed antlers, reptiles, insects, tree sap, pine cones, fungi (including mushrooms that are poisonous to humans), eggs, young birds, mice, and young rabbits. 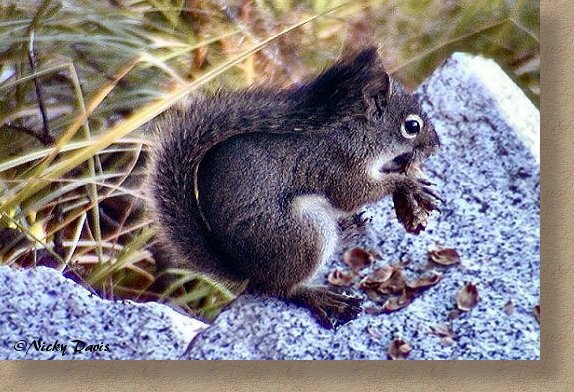 They store many seeds and nuts underground, in piles, or under rocks for the winter and can relocate caches buried a foot underground and 13 feet below snow using their sense of smell. Still some seeds aren't recovered making the squirrels a key tree planter and seed disperser.